Things have been tough on Peach State turkey hunters, but 2019 may be a turnaround. Georgia turkey hunters had a rough time of it in 2018. Statewide, the 2017 turkey reproductive season was, overall, the worst season documented by the GDNR. But hunters shouldn’t lose faith just yet. The 2019 season is shaping up to be, if not great, at least moving in the right direction. Bond is talking about reproduction numbers, which are a key indicator for how a turkey season is going to go. Over the last seven years, really only 2011 and 2016 were decent years for turkey hatches. Harvest levels peaked in 2013 at nearly 10,000 more birds than in 2011. Even in the last three rough years, harvest levels have increased slightly each year. Hens are more important to the overall turkey populations than the males, and two major metrics used to track hens may show some signs of relief for the 2019 season. Though some data for the mountain and coastal regions hadn’t been tabulated as of this writing, statewide numbers appear to show more than 40 percent of hens had poults this season and each hen averaged more than 1.5 poults. Bond said the findings are interesting given that this year has seen large amounts of rainfall, which in other years has caused survival rates for poults to dip. “It must have been hitting at the right times this year,” he said. Typically, two years after a decent hatch, like that in 2016, you would expect to have a good harvest, Bond said, but that didn’t happen in 2018. Bond said last year was so horrible that there were probably just fewer birds out and about. All of which could point to a slightly revived turkey population this year, albeit one that’s older, wiser, and harder to hunt. Smarter Georgia turkeys will mean Georgia hunters need to get smarter too. Instead of looking for areas where the most birds were shot last year, dive into the state’s online harvest data to see where the most younger birds were shot. WMAs such as Lake Russell in Habersham County, Dawson Forest in Dawson County, or Tuckahoe in Screven County didn’t crack the top five in total birds harvested. But on both more than a quarter of the birds taken last year had beards shorter than 6 inches, which means a higher chance that some of the area longbeards are still there for the taking. Neither have quota hunts, so you can stalk birds all season. Lake Russell in particular is an area that GDNR biologists often recommend. The hilly, forested terrain is perfect for turkeys. With 17,000 acres to choose from, there’s plenty of prime spots to try, but you may want to do some preseason scouting to narrow down the search a bit. Another WMA that’s open all season is 6,300-acre Mayhaw WMA down in Miller County. Mayhaw had an exceptional deer season last year; in the past, it hasn’t had as much success with turkeys, but Howze said that may be changing. Another southwestern Georgia WMA worth looking at is perennial favorite Chickasawhatchee, a 19,700-acre parcel located outside of Leary, Georgia. For the 2019 season, there are three quota hunts scheduled on the property before the entire area is opened up to public hunting in mid-April. One of the challenges to hunting Chickasawhatchee is that more than half of the property is swamp, inaccessible unless you’re willing to “get wet or swim”, said Howze. A third standout turkey spot in the area, River Creek WMA, regularly posts success rates around 70 percent, which makes competition to get in fierce. This quota only may be as close to a sure thing as you can get, if you have the quota points. In middle Georgia, quota points are often spent at Rum Creek WMA , but the nearly 6,000-acre property in Monroe County may not be the best bet this year, as the area has seen a downward trend in numbers. “We’re hoping to bounce back,” Bond said. “It’s not a good feeling what’s happening to Rum Creek over the last couple of years. There are two brand new spots in middle Georgia to try, though. Gaither WMA, a 2,129-acre tract in Newton County will be going on line for turkey hunting just in time for the 2019 season. The second new property is going to be a new tract added to the Chattahoochee Fall Line WMA called the Hilliard Tract. The new 7,100 or so acres will be located in Marion County and will most likely be mostly quota hunting for turkeys for the time being. If you’re a hunter at heart who just happens to live in the city, look no further than Paulding Forest WMA. Located just 35 miles northwest of downtown Atlanta, it’s hard to beat Paulding Forest for convenience. It’s open all season and the short drive means that you can make multiple weekend trips without straining the gas budget too badly. Paulding is a huge area, more than 25,000 acres, which means the chances of rubbing elbows too closely with another turkey hunter are slim. 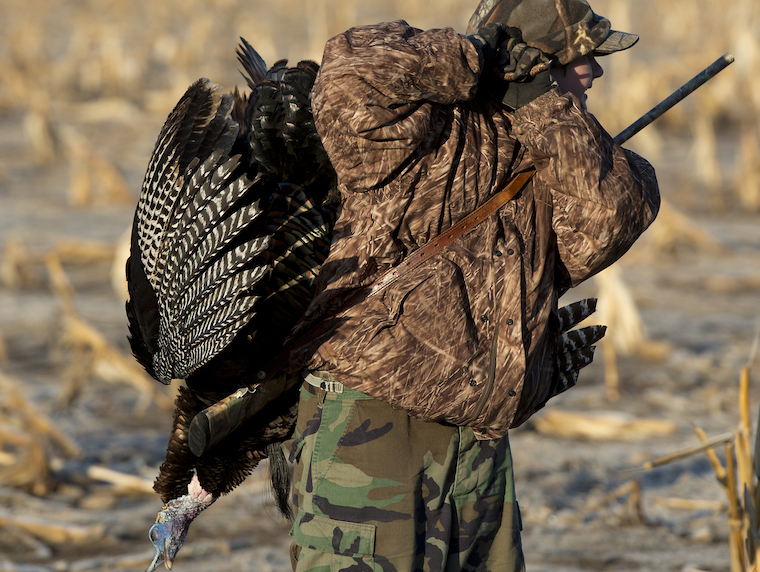 Plus, last year 26 percent of the birds taken had beards of 6 inches or less, so the big boys are still out there. Along the Georgia coast it’s hard to go wrong hunting at Fort Stewart. This US Army base is the home of the Third Infantry Division but also contains 285,000 acres of forest property on the Fort Stewart Military Reservation. Over the past three years Fort Stewart has consistently ranked in the top 5 WMAs for most birds killed. Part of that is undoubtedly due to higher hunter numbers, but the sheer size of the place means less pressure, even with an increase in hunters. Hunting Fort Stewart can be rewarding, but its also a little more involved than your average WMA hunt. In addition to a Georgia hunting license, you’ll need to apply for an installation permit, which costs $60 for civilians, but less for veterans and active duty service members. You’ll also have to register any firearms used with Fort Stewart officials. You also have to join Fort Stewart’s iSportsman website to check in an out of the 178 different areas that make up the reserve. Since the fort is an active military base, different areas are opened and closed to recreational purposes based on military needs; these closures can be found on the same website. Georgia’s 2019 turkey may very well be better than last year’s, but there’s still a long way to go before Peach State turkey hunting can truly be said to have recovered. One of the ways that hunters can help is to shoot birds later in the season, Bond said. Past research conducted at Cedar Creek WMA hints that shooting gobblers too early in the season can have a big impact on breeding rates. Working off this theory, the GDNR plans to push back the opening date on quota hunts at Cedar Creek from March 23 to April 6. Another step the state is taking to try to help manage the turkey population is hiring a new staff member whose sole job will be looking after the state’s toms, jakes and hens.